The Commercial Mover of the Year 2017 is the British Association of Removers prestigious UK commercial removals competition and open to companies who carry out commercial relocations as part of their service offering. 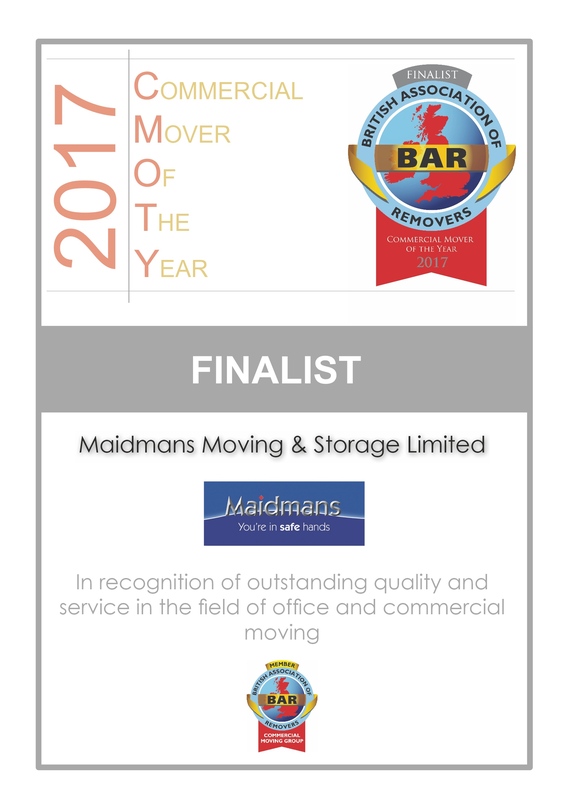 Maidmans Moving & Storage is proud to be runners up in this year’s Commercial Mover of the Year 2017. Maidmans achieved the Finalist stage in 2008 and 2014 and were awarded a Certificate of Merit in 2012. The award is designed to reward best practices and partnerships between commercial movers and their clients, with each case study being judged individually and on its own merits. Whether moving a small business or delivering a large scale logistical/complex project, Commercial Mover of the Year encourages companies to raise the standard for commercial relocation services. We look forward to the forthcoming announcement detailing the companies who have progressed to the next stage of the competition. For more information on Maidmans business / commercial moving service visit our Business Moves page.